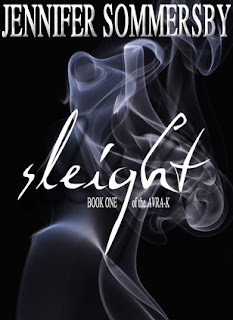 I received an advance copy of Sleight to review from the author Jennifer Sommersby and was very excited to dig into this book. I love stories that have magic in them and I also love the circus setting. In a nutshell Gemma is grieving her mother's death when her whole life us upended. She soon comes to learn that her travelling circus life will stop that she has to attend a real high school and deal with all that comes with it. She is a very strong character and isn't afraid to get her hands dirty if she has to but, she is reluctant to deal with the ghosts (or "Shades" as they're called in the book) or her destiny to save the world. Enter Henri Dmitri gorgeous and smart. Gemma and he are instantly drawn towards each other although everyone else wants to keep them apart. They must figure out their strange connection and why Henry's dad Lucien wants them dead over a book called the AVARA-K. Their story of love and loss will have you reading late into the night. I loved this book! Gemma's character reminded me of myself when I was younger. I did have a bit of a hard time with Henri at first he is just too nice but, throughout the book I found myself falling in love with him just like Gemma. There's also a boy named Ash who I really really like. Jenn I think I'll keep Ash for myself. I loved the characters in this book Marlene, Ted, Junie, Ash, Gemma, Henri, and uncle Irwin he was an awesome uncle who made me laugh. I also liked how the circus was used as a main part of this first book seeing as we'll be headed somewhere else for book 2. Jenn's writing is so easy to read you just melt into the story and you actually feel for all the characters. I could smell the circus, taste the Jack Daniels, and feel their genuine pain. I am anxiously waiting for book 2. So if you like a good love story with twists, turns, and magic go buy this book! Thank you again Jenn for the Advance copy! Seriously though, I like the idea that this is a story of someone leaving circus life versus escaping to it and having to then transition to the humdrum of a "normal" existence. And I'm so glad going into the read that there's a second book in this series. No need to hang head in shame. That's like saying IRL there can't be two guys named Mike. But on a much more serious note - there will be no Ash killing in the world of Sleight. And oh how you've tortured me before I've even read it! Yes, Jaime, I'm cluttering up your blog with my long comments! Haha no worries Rachel. It's better than no comments ;D yes this is definitely a must read! I won't kill Ash. I don't think so, at least. Time will tell. He's been really naughty lately, though, for reals. I hope he sees the light soon. But naughty is good! We like the bad boy. This book has just moved even closer to the top of that pile! Yes! I really love that bad boy ;) Ash brings something extra to the book. Lol me too Britney! Didn't you see above in the comments I made Jenn promise not to kill him?